Leading hotel Management Company Naples Hotel Group shares that the roof has been completed for the TownePlace Suites at Miami International Airport. 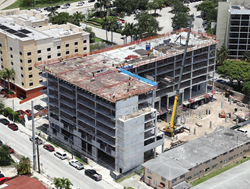 The Naples Hotel Group, a leading owner, operator and hotel management company for nearly 18 years, announces the topping out of the TownePlace Suites by Marriott at Miami International Airport. Naples Hotel Group has the contract to oversee development and management with owners Hotelex Airport, LLC. As part of the contract, NHG is leading the overall development and will manage all aspects of the opening and operations. The general contract for the building has been awarded to Seawood Builders. The hotel started construction in January of this year. The Florida hotel is located near the southeast entrance of the airport on NW 11th Street. The hotel will have 165 suites and on-site parking. It also boasts an expanded lobby with a full-service bar, outdoor pool and fitness area. Hotel anticipates opening during the first quarter of 2017.